Of all the things we did when building our house, the backyard is my absolute favorite. Don’t get me wrong, I loved picking tile, light fixtures and color palettes, but our backyard is my happy place. There is just something about watching my little people run around back there playing make believe enjoying the sunshine and sipping an ice cold soda that cannot be beat! 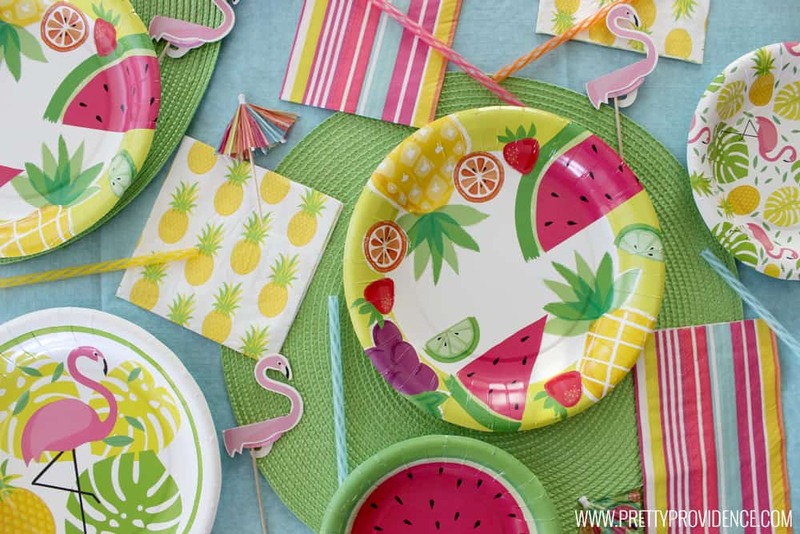 I’m going to blog the whole thing soon, but I am so excited about my recent Michaels’ summer finds that I just had to share a sneak peek so you guys had time to run and grab your own before they are gone! 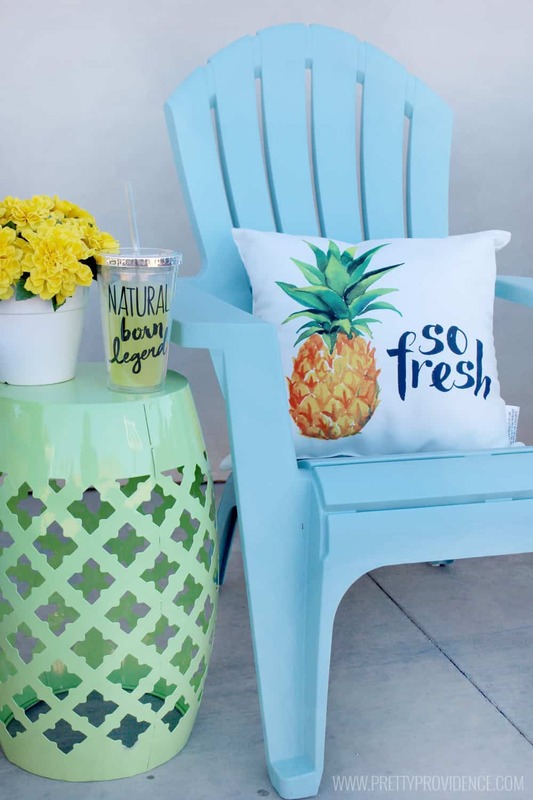 The pineapple pillow is my absolute fave. I mean, I think it was love at first sight! Haha. We have a big cement basketball pad on the side of our house, and that is where the kids end up playing most of the time, riding bikes etc. Over on that side we had these blue chairs where the adults like to sit and visit while we watch the kids play! But, that was basically where the decor ended. Because of the nature of the space, it isn’t functional to have a large rug or poufs or some of the other things I might typically use, but I still wanted to brighten things up, and I love how it turned out! 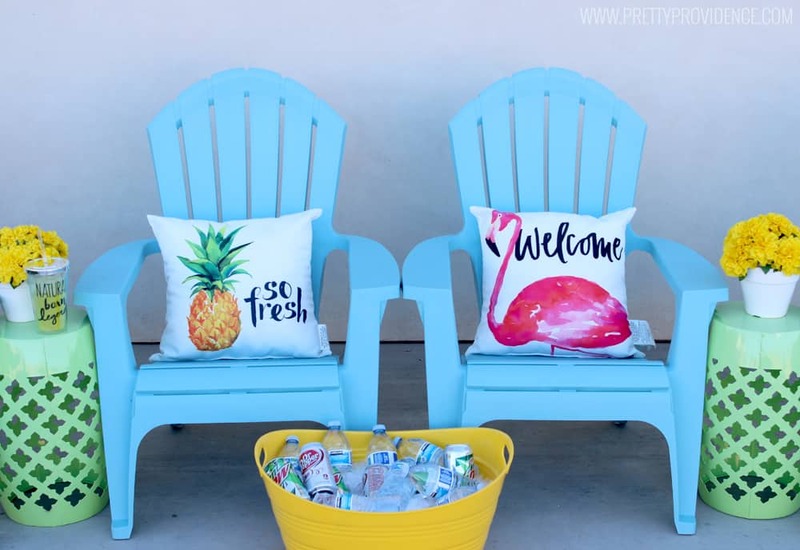 Basically every time I was outside I thought to myself how we needed some side tables for drinks, snacks, etc. But when I went to the store they were so expensive and I just couldn’t bring myself to pull the trigger. When I found these colorful cuties at Michaels for $39.99 (before my coupons) it was a DONE DEAL. They are the perfect size, so affordable, and now everyone has a spot to put their drinks.. hallelujah! 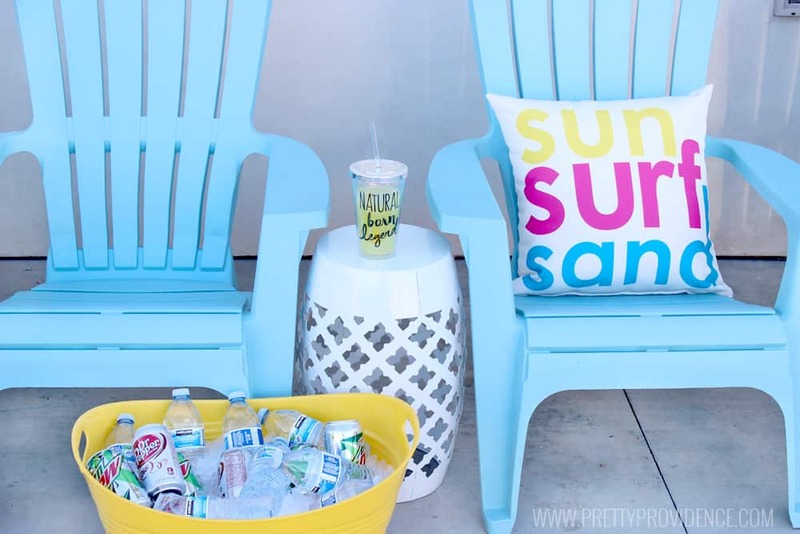 The drink bucket and cute tumbler are also from Michaels! I just couldn’t help myself, haha! This is a peek at the full space, the chairs back the side of my house facing the basketball court. 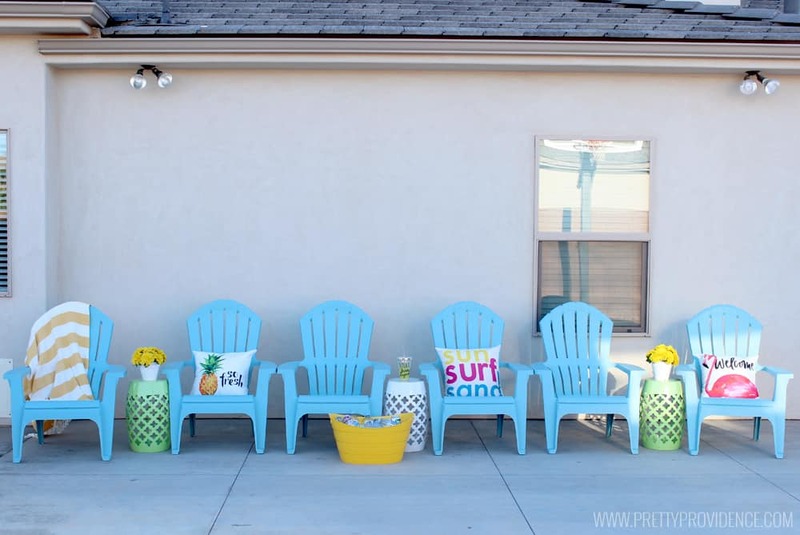 Isn’t it amazing what a few bright accents can do?! The cute flower pots and faux flowers were from Michaels as well! Oh and don’t you worry! 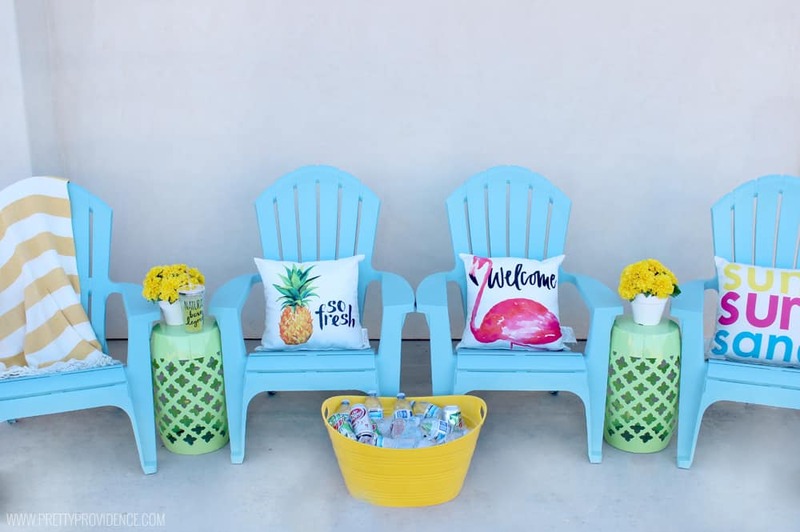 Bright and happy outdoor decor is not the only fabulous summer find Michaels has going on right now! 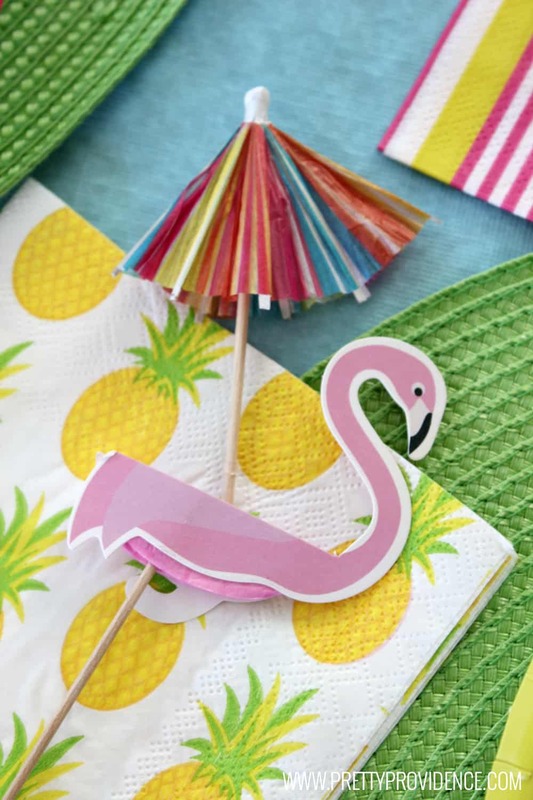 They have to die for adorable summer party supplies! I was going to stage a super cute table to show you guys, but the stupid wind here just would not cooperate (come on, Mother Nature) so I just threw them down on my table and snapped a few pics because I have to show you all this goodness! I mean, are you kidding me?!?! Soooooo many cute options and they all go so well together! 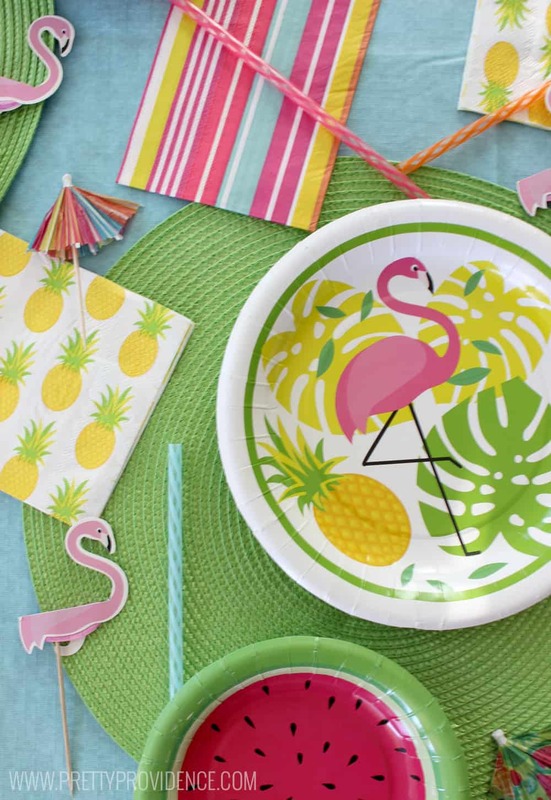 If you want your own summer party supplies you can find them here, or in store in the seasonal section! 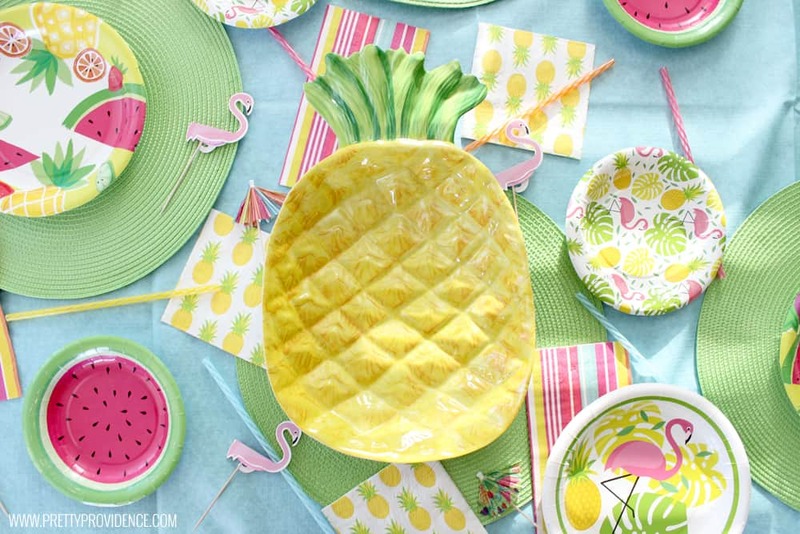 Also, if you are looking for more summer fun inspiration be sure to check out Michaels’ blog, The Glue String, for tons of fabulous party and decor ideas! Seriously though they are killing me with those flamingo picks! Gah! What item is your favorite? Hey I just searched for it and I’m not finding it online anymore! But I walked by my store yesterday and they still had a ton of them on display! So sorry, hope that helps! I love it! I had seen those tables at Michael’s and really wanted them. But our patio is all rocks, so they probably wouldn’t set real well. But your space is so nice and cheery! Love the end tables! Were those from Target, too, or somewhere else? They are from Michaels! And SUCH a good deal! I love this look! I too am wondering what you do with the wall. I was thinking some wall art. I’ll be checking back to see…. Where did you get the chairs? I love that color. How fun! Ive been trying to liven up our carport area and this is great. Do you plan on hanging plants or anything on the wall behind? I hadn’t really thought that far but that is a great idea! Thank you!